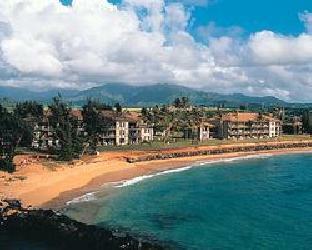 Pacific Fantasy, within The Pono Kai Resort, is on the eastern coast of Kauai. Relax by the resort’s outdoor pool or on the beach. You will find shuffleboard, tennis, and putting greens on site. You can play golf at one of several courses close by. For more action, head offshore and try surfing, snorkeling, boating, or fishing. Kauai is called the “Garden Isle” because of its natural beauty. Helicopter tours will take you over beautiful beaches, lava-rock grottoes, and scenic viewpoints. The resort also offers a seasonal children’s program.